One of the oldest law firms in the country, Estudio Beccar-Varela has acknowledged expertise both in Argentina and abroad. A high number of Beccar-Varela’s attorneys have studied or worked in the United States, Europe and Latin America. Its international presence, prestigious clients and extensive experience in Natural Resources, Labor law, Foreign Investment and Antitrust law makes this firm a very attractive placement for our students. Estudio Marval O’Farrell and Mairal in Argentina The largest firm in Argentina whose clients include a variety of Fortune 500 companies, the Argentine government and the Argentine Central Bank, international organizations such as the World Bank, the International Finance Corporation (IFC) and the Inter-American Development Bank. One of the most prestigious firms in Argentina, M. & M. Bomchil works with correspondents in every province in Argentina serving midsize to large local & multinational companies as well as public agencies and non-profits. Among its awards, the firm received the Client Choice award from the International Law Office in 2007. M. & M. Bomchil specializes in Commercial, Administrative, Competition, Regulatory, Tax, Labor, and Environmental law. With over 100 lawyers in São Paulo and Rio de Janeiro, SCBF is made up of top lawyers with a vast degree of international expertise and experience abroad in Europe and the United States. SCBF has been ranked as a leader in Banking and Finance, Mergers and Acquisitions, Energy and Natural Resources and Project Financing. Núñez, Muñoz & Cía. Ltda. renders legal services to national and foreign clients in different areas of the law, including among others, Corporate law, Project Financing, Natural Resources, Antitrust law and Litigation. In Chamber Latin America’s 2010 edition the firm was ranked among the most relevant Latin American law firms in Latin America. Founded in 1934, Brigard & Urrutia provides legal advice and assistance in all relevant areas of Business law and represents clients before the government and the courts, as well as before national and international arbitration panels. The firm serves a global clientele formed by industrial, commercial and service companies, banks and other financial institutions, including private equity funds, insurance companies, as well as national and foreign government agencies and companies. 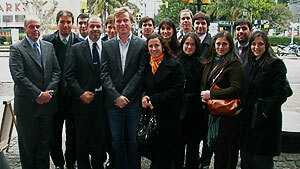 Who’s Who Legal designated Brigard & Urrutia Colombia’s law firm of the year in 2007. Considered the leading firm in Peru in Banking and Finance, Corporate law (including mergers and acquisitions) and Tax law. The prestigious Law Business Research Ltd. has recognized Rodrigo, Elías & Medrano Abogados as “The Law Firm of the Year” in Peru during three consecutive years: 2006, 2007 and 2008 in its publication “Who’s who Legal Awards”. Spain’s most prestigious IP law firm, Gomez-Acebo & Pombo has a strong reputation in the European Union for its expertise in International and Criminal Litigation, Real Estate Transactions, Project Finance, Telecommunications law and M&A work. This sophisticated law firm attracts enthusiastic Spanish- speaking students to our program who are interested in pursuing a career in international private law. Latin Lawyer Magazine rates Guyer & Regules as the most established corporate firm in Montevideo. Extensive experience in high-profile transactions—especially M&A and Joint Venture Agreements, Corporate Finance and Banking—makes this the leading international firm in the Uruguayan legal market. MBGC Attorneys is a leading boutique law firm specializing in Bankruptcy and Water Law. In his forty years of practice, Dr. José Botta has participated in all aspects of bankruptcy law and his knowledge in this area has been recognized on numerous occasions by judges and practicing attorneys. Dr. Enrique Guerra is one of the country’s most distinguished law professors in the area of Land and Water Law. Hoet Pelaez Castillo & Duque, Abogados is one of the oldest and largest full practice law firms in Venezuela, covering almost all aspects of the law. In addition to serving many of Venezuela’s leading private companies and public corporations, the firm represents a large number of foreign companies and financial institutions doing business in Venezuela, making an internship very appealing to our students.